Ms. Howlett concentrates her practice on all aspects of school board representation, including general legal matters, labor and employment, and special education. In addition to providing guidance on daily legal matters, such as board of education meetings, harassment, intimidation and bullying complaints, student discipline, and the development/review of school board policies, Ms. Howlett regularly attends meetings on behalf of district Child Study Teams, including eligibility, evaluation, and IEP meetings. 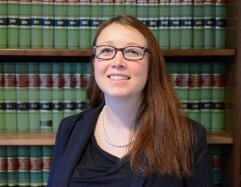 In her special education practice, Ms. Howlett has successfully defended the Firm’s clients in complex special education litigation in the Office of Administrative Law and appeals to the U.S. District Court. Ms. Howlett uses her extensive experience to conduct lectures and seminars for school administrators in the areas of special education and student discipline. In addition, Ms. Howlett supervises the New Jersey Employment Practices Hotline Attorney program on behalf of the New Jersey Schools Insurance Group, which provides guidance to dozens of school boards on issues of tenure and seniority, school employee discipline and removal, Family and Medical Leave Act, New Jersey Family Leave Act, New Jersey Law Against Discrimination, and the Americans with Disabilities Act. Prior to joining Cleary Giacobbe Alfieri Jacobs, LLC, Ms. Howlett served as judicial law clerk to the Hon. Michael A. MacDonald of the Superior Court of Alaska.